the Defender of Life Society. The Defender of Life Society is the friends of the Human Life Review who have established a bequest or planned gift for the Human Life Foundation. Learn more about the Defender of Life Society by clicking here. Do you have an IRA you no longer need? Do you have securities you would like to unload without having to pay tax? 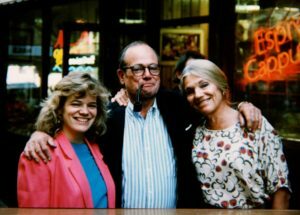 J. P. McFadden, founder of Human Life Review, with his wife Faith and their daughter Maria in 1992. Maria is now Maria Maffucci, Editor of Human Life Review. The Human Life Foundation is grateful to receive many different kinds of gifts. All gifts to the Human Life Foundation are 100% tax-deductible because we are a 501(c)(3) charitable foundation under the IRS. You can make a gift of an IRA or other securities at any time. Please click here to start the process! Or have your broker call (212) 685-5210 during regular business hours to arrange the transaction. Read our entire introductory letter here! Mail-in reply forms available. Include the Human Life Foundation in your will or estate plan. Click here for some suggested language. Tell us about it. Click here to tell us you have done it. Certainty that your assets will continue to strengthen the backbone of the pro-life movement when you no longer need them. With help like yours, the Human Life Foundation’s flagship publication, the Human Life Review, will continue to illuminate truth and reason in defense of life. If you would like to receive a call about the Society and ways to help, let us know below! 647 people have visited this page. 1 have visited this page today.